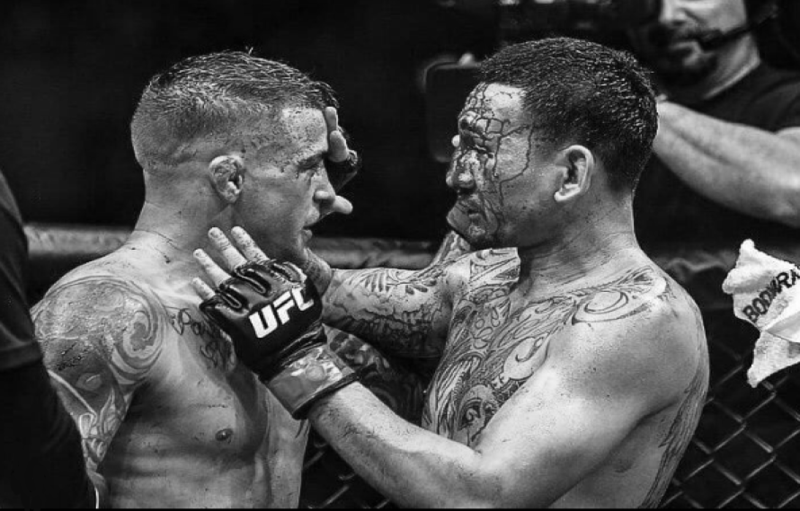 Dustin Poirier and Max Holloway had a fight for the ages at UFC 236. As classy as these two fighters are, it is no surprise that the two have been nothing but kind afterwards. Follow the epic battle, the two have traded heartfelt messages. It first took place in the Octagon, after the fight. The two embraced and showed incredible amounts of respect. Dustin Poirier and Max Holloway would share a moment. “The Diamond” would apologize for cursing at Max, who was quick to forgive. Poirier also shared Max’s own message, “To beat the best you have to beat the best. Blessed.” Poirier went on to call Max a great father and fighter. However this was just the tip of the iceberg. Following a kind statement from Max via social media, Dustin took to his own Instagram with a message. Dustin Poirier and Max Holloway were the main event of UFC 236. The two were fighting for the interim UFC Lightweight Title. This was Dustin Poirier’s first title fight in 22 UFC appearances. Max Holloway was moving up in weight, to try to win a second title. The two were respectful in the lead-up, and nobody wanted to see either man lose. The two fighters had an instant classic in their rematch. It was a very back and forth affair, with Poirier winning via unanimous decision. This would award him with the interim title, setting up a bout with Undisputed UFC Lightweight Champion Khabib Nurmagomedov. Currently the plan is for the two to fight in September, perhaps in Abu Dhabi.